The Acts of the Apostles tries to explain to Gentile converts the Jewish origins of Christianity. One of its themes is how the first Christians imitated Jesus. Here the apostles work cures and draw large crowds, as did Jesus. Some in the crowds will not commit. The Book of Revelation was written to bolster the perseverance of persecuted Christians, and to settle some doctrinal disputes. It's told in the form of a vision. Much of the language is symbolic, to hide its meanings from the persecutors. One of John's purposes in writing his gospel is to provoke a firm decision for Christ among early converts who were backsliding. Today's passage tells about a famous backslider, but also offers the fulness of life to others who don't have his privileged vision. The Literary and Liturgical Settings: As a book, The Acts of Apostles tells the story of the growth and struggles of the earliest Christian community after Pentecost. 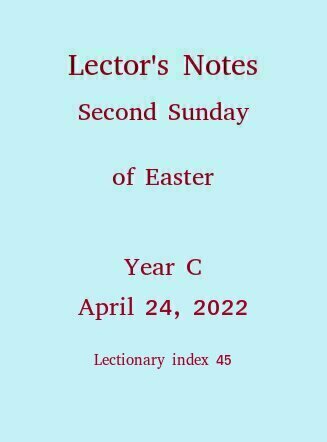 In the Sundays of this liturgical season, we get these highlights: today early growth in numbers, and miracles like those of Jesus; next week, censure from the Jewish authorities; then the first Gentile converts; on the Fifth Sunday of Easter, travels with Paul; then a pivotal dispute within the church about the obligation to keep the law of Moses; then the first martyrdom of a Christian; then, in calendarical if not chronological order, Pentecost. Proclaiming It: If you don't remember the sequence of the Acts drama, at least in its early chapters, put this reading into context for yourself by reading Acts, from at least the end of Peter's Pentecost speech at the link above, up to today's passage in chapter 5. This passage is a straightforward summary, and an unrushed, matter-of-fact proclamation by the lector will be just right. The reason many were unwilling to join the Christians meeting in Solomon's Portico is that the Jewish religious tribunal known as the Sanhedrin had prohibited the apostles from speaking in Jesus' name (see Acts 4). In spite of the ban, many still join. Also noteworthy here is how the apostles' careers mirror so closely Jesus' own experiences as a healer and exorcist, and as one who drew a following of the curious and the admiring. The Literary Background and our Liturgical Setting: Early in the season dedicated to celebrating and pondering Jesus' resurrection, a first-generation Christian mystic invites us to plumb his insight into mystery of the Risen One. The author wants to impress on us the authority behind what he is handing on. When he says he shares with his audience the distress, kingdom and endurance, he means he, too, acknowledges the kingship of Christ, is also worried about persecution, and relies on the same spiritual source of fortitude as they. His writing is highly symbolic. Scholars have long proposed that the visions represent ideas in coded language, clear to his audience but opaque to their persecutors, so a safe way to say encouraging words, and to read them. Proclaiming It: The assembly listening to your proclamation will need some help picturing this episode in their minds. So read slowly, pausing briefly between images. You might practice this reading at home, before someone who is not armed with a missallette. If he or she tells you "OK, I get the picture," and can verbalize it back to you, then you know you're reading it properly. Notice how the writer is honest about what he doesn't know. He has to turn to see who spoke to him. He cannot identify the one he sees, but only describe his appearance. That appearance makes the writer faint. Think how you would tell that story, communicating with your tone of voice the wonder you experienced. Give special solemnity to the words of Jesus. Emphasize his expression, "Once I was dead, but now I am alive for ever and ever," because that's what ties this reading to the Easter season. 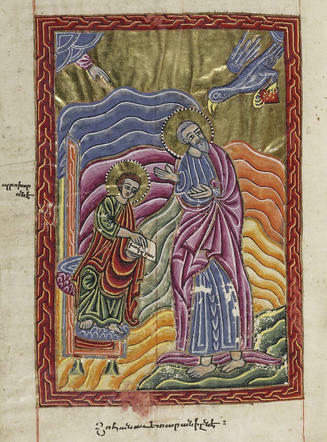 Prochorus and Saint John, in a 1609 Armenian gospel manuscript. Prochorus is one of the deacons named in Acts 6:5. According to tradition in the Orthodox Church, he became the scribe of John the Evangelist. By Unknown - The Bodleian Library, University of Oxford, CC BY 4.0, See more about the image and larger versions here.